Police to investigate attempted murder after Alexandra fire - SABC News - Breaking news, special reports, world, business, sport coverage of all South African current events. Africa's news leader. 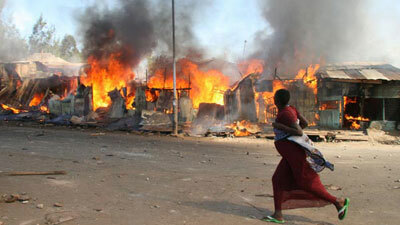 It's alleged that the man started the Alexandra fire after he had a fight with his girlfriend. Johannesburg police are investigating the attempted murder of a man blamed by the Alexandra community for starting the fire that swept through about 150 shacks on Thursday. This is alongside a probe into the cause of the blaze, which has displaced hundreds of people and caused aid organisations to appeal for donations. It’s alleged that the man started the fire after he had a fight with his girlfriend. Angry residents were about to stone him when police came to his rescue. Gauteng provincial police spokesperson, Mavela Masondo, says details are not yet clear. This entry was posted on 07 Dec 2018,08:23AM at 8:23 AM and is filed under South Africa. You can follow any responses to this entry through the RSS 2.0 feed. Both comments and pings are currently closed.